POSTED October 13, 2017 8:05 a.m. Yes, the Darlington High School musical is The Addams Family, based on the classic TV Situation Comedy of the 60’s and the cartoon of Charles Addams. This devilishly delightful family has inspired a mischievous musical comedy written by Marshall Brickman & Rick Elice (the same authors of the Tony Award-winning Jersey Boys). The Addams Family is now in rehearsals preparing for its “spooktacular” production weekend-November 24, 25, and 26. 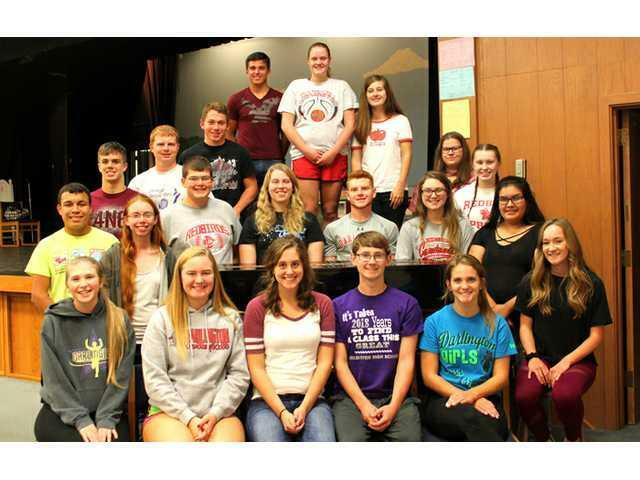 This year’s seniors involved in the marvelously macabre musical include the following students: Jackson Hemming (Gomez), Gabrielle Steiner (Morticia), Allison Horne (Wednesday), Siara Bergeson (Grandma), Michael Garcia (Conquistador Addams), Grady Rielly (Emiliano Addams), Tyler Mosley (Rodrigo Addams), Jacob Riechers (Miguel Addams), Lauren Weber (Sofia Addams), Hunter Weber (Florencia Addams), Mariah Zeier (Isabella Addams & Student Director), Asalia Diaz (Valentina Addams & Student Director), Erin Wolf (Student Director), Harlie Turnquist (Valeri Addams), Brogan Evenstad (Stagecrew), Ben Cooper (Stage Crew), Kameron Blosch ( Stage Manager), Chelsie Golackson (Stage Manager), Emma Crist (Lighting Technician), Maelle Dehalu ( Artistic Staff), Seth Johnson (Orchestra). These seniors lead a 90 plus cast and crew to create a highly entertaining and roller coaster ride of hilarity and heartfelt moments.